With warm weather comes endless amounts of wedding showers and bachelorette parties. 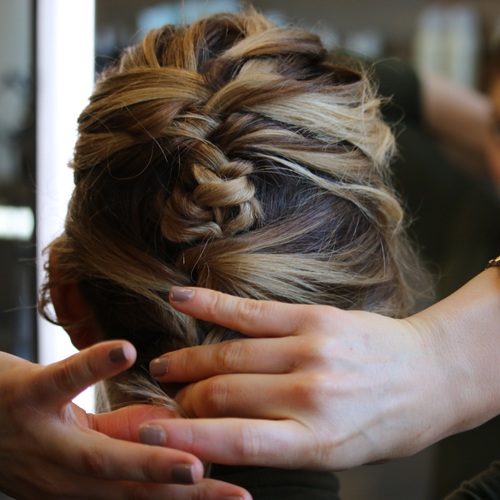 We know finding the right outfit can tricky enough, so Neroli Hair Designer, Gabrielle, took the work out of “What in the world do I do with my hair?” and created this pretty + rustic updo. 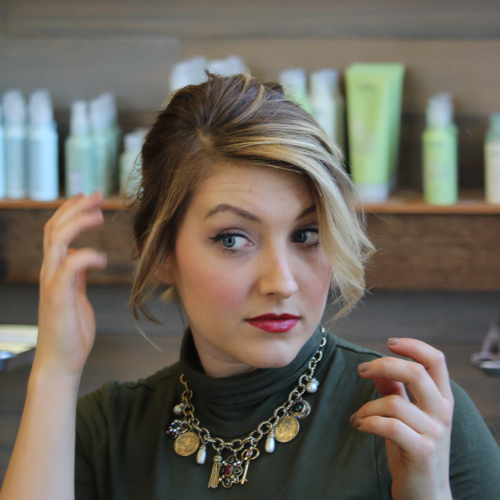 Step 1: Before styling, blow-dry in Aveda Thickening Tonic. 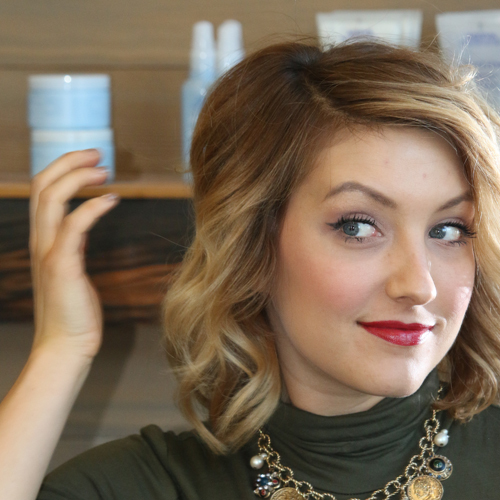 Step 2: Once hair is completely dry, take random sections and loosely curl entire head. This will make a more messy/textured curl. Step 3: Softly tease your entire head. This works best if you start at the crown of your head. Step 4: Softly tease your entire head. This works best if you start at the crown of your head. 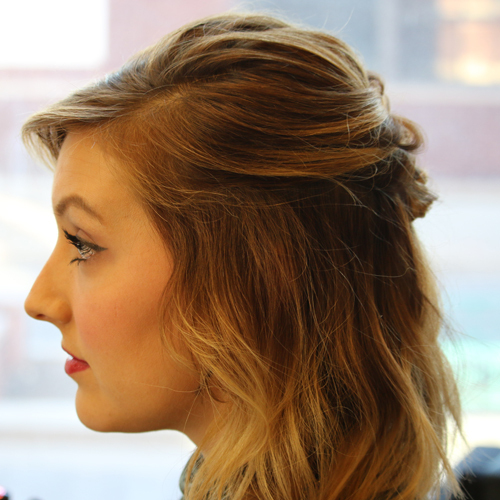 Step 5: Split hair into 2 sections, horizontally. You can choose where you want the sections to split; I recommend a little above the ear. Step 6: Use a clip or elastic to secure the top + bottom sections. Once secured, release the top section. Step 7: French “fishtail” top section. 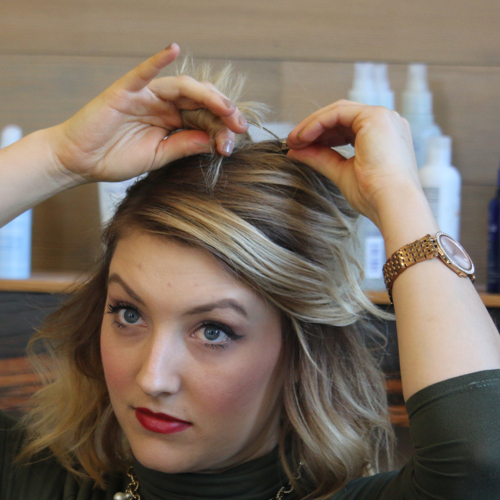 Take two strands and pick up hair from one side bringing it over to the other. Repeat until you run out of hair. 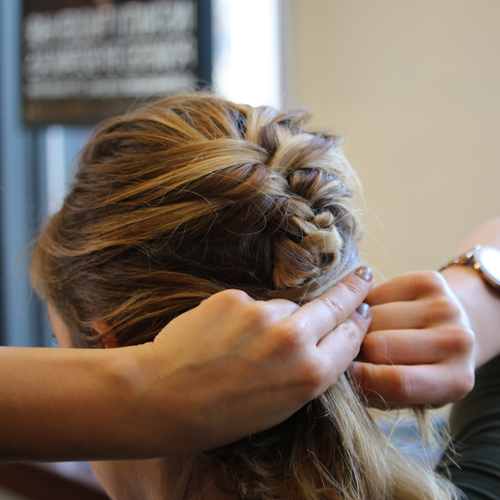 Step 8: Place a clear elastic on the braid. Take the ends hanging out of the elastic and pull the middle of it down while pushing the elastic upwards. This will create a textured braid. 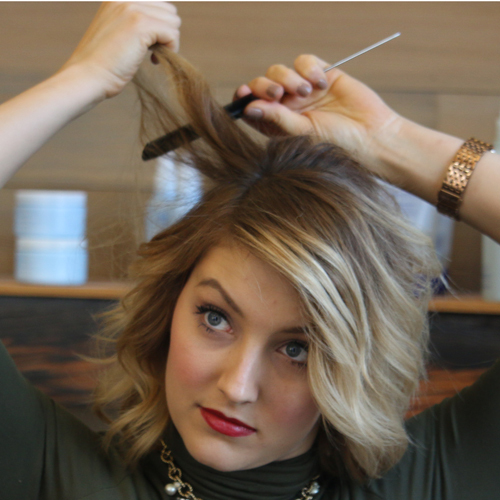 Optional: You can stop here and have a cute half up half down style, or even wrap the braid into a messy half up top knot. Or proceed to next step. Step 1: Split bottom into two strands. 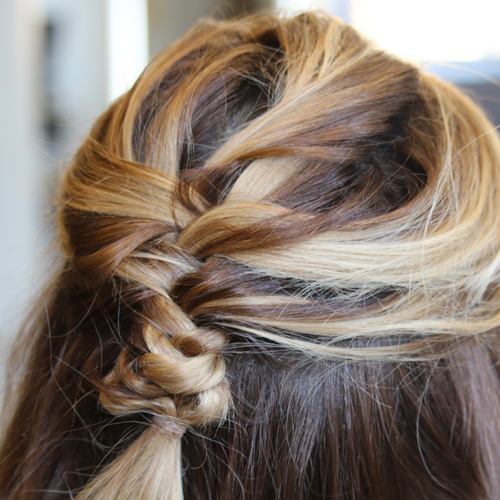 Use the first braid as your middle strand to create a three strand braid. 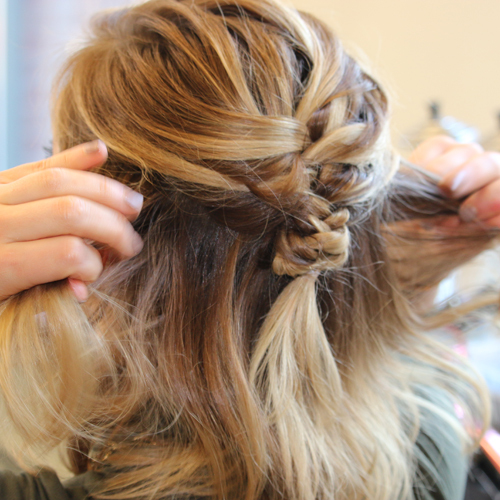 Step 2: French braid all the way down the rest of the length of your hair. 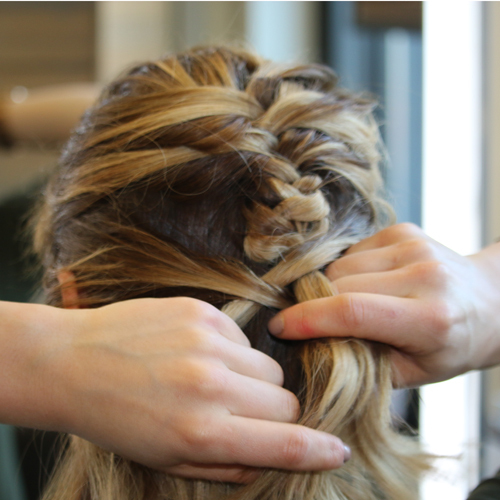 Step 3: Tie an elastic around ends and pull middle of ends while pushing elastic up creating a distressed braid. 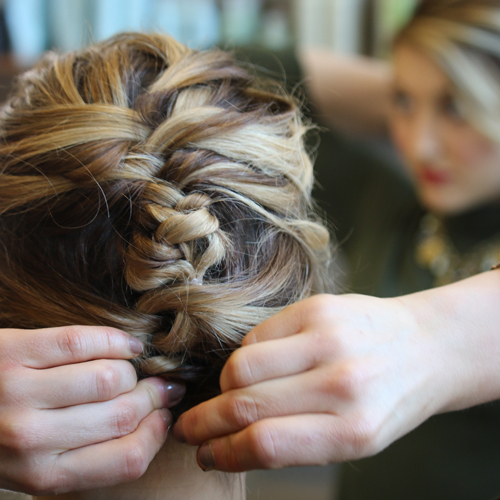 Step 4: Tuck the ends under or wrap them around in a bun. 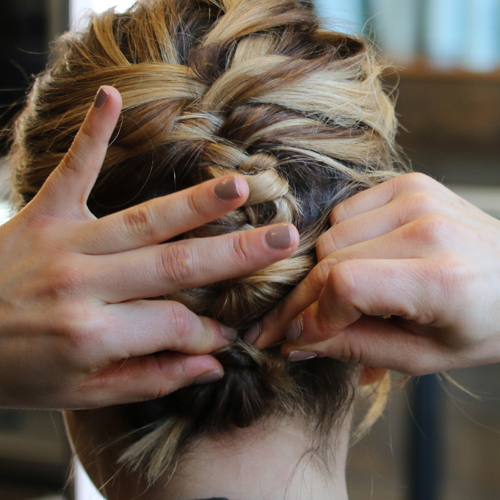 Push unopened bobby pins in where your fingers are holding the hair. Step 5: Gently pull out any hair you would like to use as face framing. 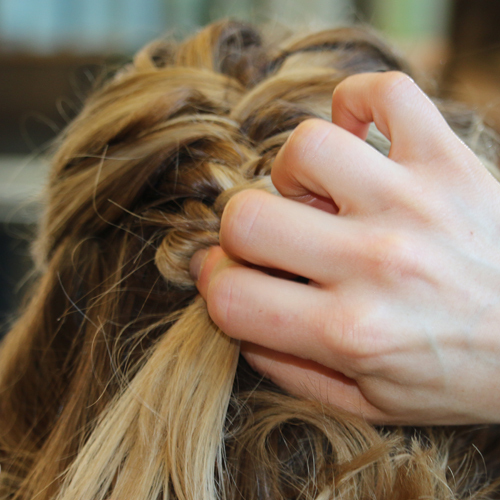 Step 6: Gently rough up the braids to give more texture and messiness to the look. This also helps blend the top and bottom sections. 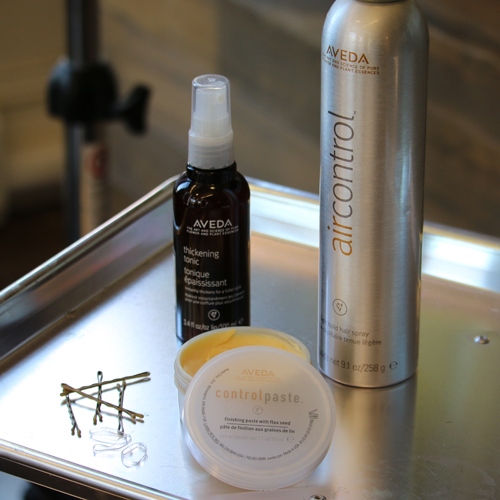 Finish with Aveda Air Control. Pro Tip: Use a hand mirror to help you view the back of your style. 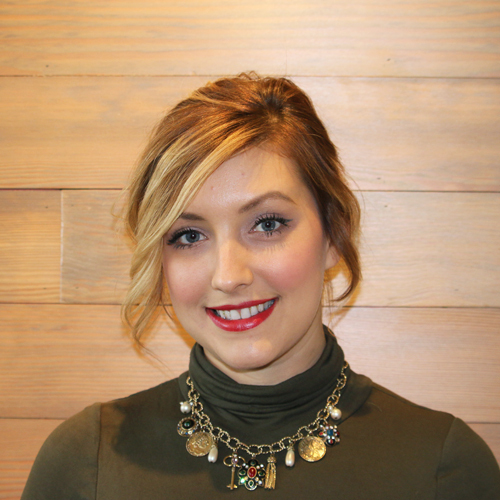 This blog was written by Neroli Downtown Hair Designer, Gabrielle. 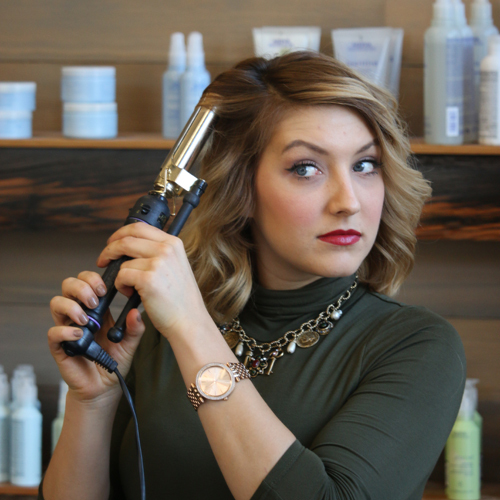 To schedule a hair service with Gabrielle, call 414.227.2888.